As everyone adjusts to Daylight Savings Time, many residents are looking forward to the wintertime activities. 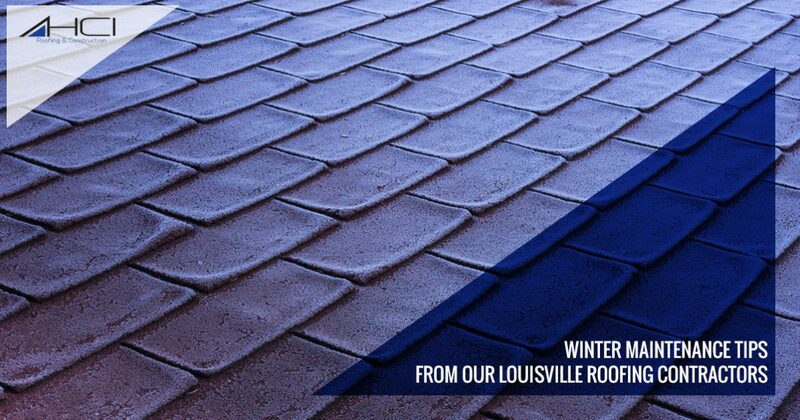 From the holiday festivities to increased snowfall, residents in need of roof repairs in Louisville are looking at the snow as more of a risk factor than anything else. It’s important to take proper care of your roof system, and the freezing season represents a time of concern and diligence. HCI Roofing and Construction is proud to be your team of go-to roofing contractors in Kentucky, providing comprehensive roof services to ensure that your house is optimally protected all year long. While winter care for your roof system is often summarized as “Don’t get on the roof!”, there are a few actions that homeowners can take when the snowfall proves to a burden. If you’re in need of expert assistance, be sure to contact our roofing company today! Keeping your roof and gutters clean will help to prevent a lot of the damage done by heavy snowfall. When left unchecked, the buildup of leaves and grime can create major risks for your gutters. Beyond the higher weight demands placed on your roof, moisture can build up and seep into the siding and fascia. Water damages can be concerning, especially during the snowy season! It pays to clear the area before the snow falls in order to avoid debris buildups in the future. The buildup of ice dams can create serious concerns for your home, consisting of freezing blocks that can serve to collect water and cause damage to insulation, siding, ceilings, and more. Temperature differences can be blamed here, as warmer water melts off and runs down your roof, collecting in a cold spot to create a ridge of ice. Be sure to inspect your home for ice dams, as these constant moisture sources can cause the need for serious roof repairs. While snow is a normal part of winter, heavy buildups can create moisture and structural concerns for your roof system. HCI Roofing recommends safety as the top priority in this venture, as your health is much more important than a piece of property. Beyond structural concerns, buildups of snow can lead to excess moisture contact for the sides and roof of your home. Be sure to clear away snow near your gutter openings to enhance drainage. Keeping your roof safe and happy can be a challenge, and one often left to professionals. Whether you’re a homeowner hoping for an inspection or a resident needing emergency roofing repairs, it’s often recommended to ask an experienced roofing contractor for assistance. The risks to both the inhabitants and the roof itself make even the most mundane tasks a major risk. Anytime you are worried about the safety or sturdiness of your home roofing system, be sure to reach out HCI for assistance! If you have any concerns as to the condition and safety of your home’s hat, be sure to reach out to our roofing company for assistance. HCI Roofing and Construction specializes in gutters, roofing, and railings to keep your home as safe and sound as possible. Contact us today to learn more or to schedule your roof inspection!